Last month, I was completely blindsided by the creepy, compelling opening to The Vision. Tom King and Gabriel Hernandez Walta crafted an incredible first issue that explored the Avenging Android’s new family, and how coldly inhuman they were—but the second issue gives them some dark, fascinatingly human problems. 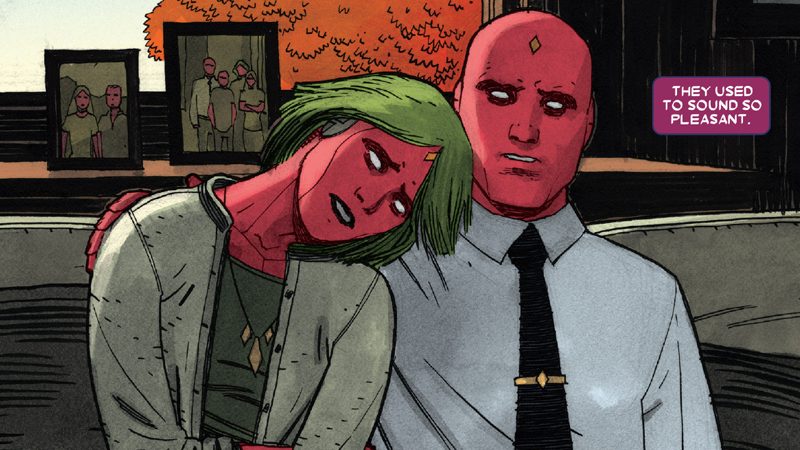 Spoilers ahead for The Vision #2, by Tom King, Gabriel Hernandez Walta, and Jordie Bellaire. The Vision #2 picks up in the wake of Virginia’s decision to lie about the death of Grim Reaper at her hands to Vision. It’s once again a master sequence from King, who combines the grisly humanity of Virginia’s action—she killed to protect her children, and she’s lying to protect them now—with the cold, unemotional way she recounts her lie to her husband. It’s just one of the many ways that the issue brings these two parallels together, the haunting robotic nature of the synthezoid family mixed with the human turmoil they find themselves thrust into makes for a comic that is absolutely laden with stand out moments. All three of Vision’s family members get that moment in the issue, that sharp stab of humanity in and amongst the otherly nature of their android selves. For Viv, it comes in the opening splash page, her half-missing body strewn across a hospital bed as she repeatedly calls for her mother—the literal inhumanity of her robotic form, all tubes and wires, contrasted with the emotional humanity of a dying girl crying out for her mother. For Virginia, it’s in her carefully constructed lie, immediately followed by her and The Vision hugging in the eerie silence of their house. But strangely enough, it’s actually The Vision himself who gets the most heartbreakingly human moment of the story. When Vision and Virginia are called in about Vin’s outburst in the canteen, the Principal equates the Visions with guns—metal shaped into a form that can kill—arguing that Vin and Viv have no place among other children. Vision rattles off about how he’s an Avenger, and the Principal is only still alive because The Vision has saved the world 37 times, so he can prove that he’s in control of his family and their interaction with the wider world. For Vision, it’s meant to be a moment of triumph, that he’s proved both himself and his family. But to the reader, who know about the dark moments his family are hiding from him, it’s surprisingly tragic: A moment of unwitting, human fallibility from someone who thinks of himself in that moment as completely infallible. How little he knows that it’s all falling apart for him, right under his nose, is like a knife through your heart. And it’s only going to get worse. The omnipresent narrator states that the Principal might have saved the world if only he’d been harder on The Visions, a delectable portent of things to come—but the more immediate threat is revealed in the issue’s final pages. Someone is blackmailing Virginia, someone who saw her bury the corpse of the Grim Reaper. It’s a dramatic and well done twist, but when you think about it, horrifying (and after all, The Vision is an increasingly nerve-racking horror comic as much as it is one about superpowered androids). We’ve already seen Virginia snap once, the razor-thin facade between quiet wife and unstoppable killer peeling away. If someone is trying to push her buttons, so to speak, to make her fearful, what she could possibly do next is petrifying to think about. The power of something deliberately not-human, given to someone being pushed into very human emotions. Consider this your monthly reminder to read The Vision. It is, without a doubt, one of the boldest and most captivating series coming out of Marvel at the moment—and quite like anything I’ve seen in a mainstream superhero comic for a long while.